Talent and characters in costume make meetings and parties more interesting, and as event photographers in Los Angeles, we have had the opportunity to shoot many different kinds of talent. 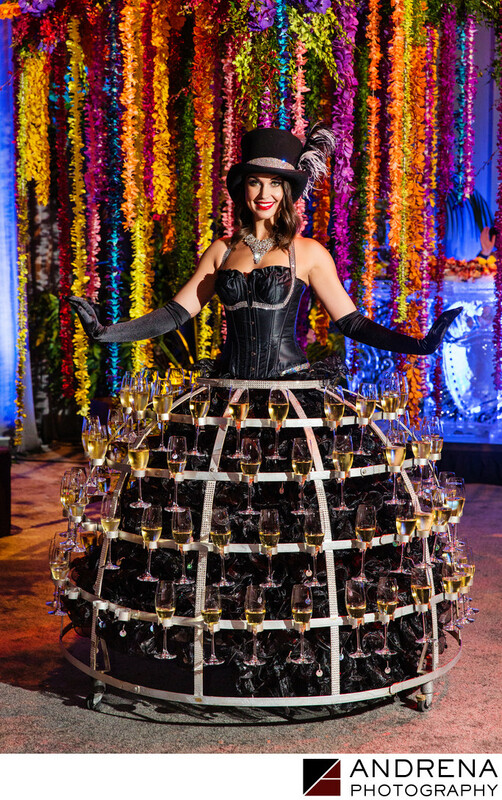 This costumed actor wore a skirt frame that held 100 glasses of champagne. Guests were encouraged to take a glass from her skirt as they entered the event, which took place on a Sony Studios sound stage. This character's long black gloves, top hat and bustier-style top helped give her presentation added style. Location: 10202 West Washington Blvd., Culver City, CA 90232.